A waterfall with a hidden cave !!! 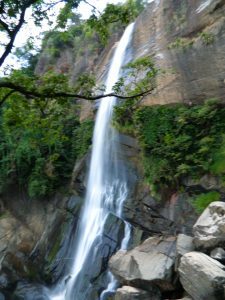 Peessa is a lesser known waterfall in the Badulla district. The waterfall has about 45 m height. This waterfall is also located in a jungle, but can be visible from the Peessa village and also from the school in that village. The water stream starts at the Lunugala mountain range and it is a healthy stream even during a drought. It is the water resource to irrigate the plantations of nearby villages. It also has a mini hydraulic power station. An important feature of this waterfall is the cave behind it. The opening of the cave is covered by the waterfall. But that cave is accessible by the foot path at a side of a waterfall. According to the folk stories, it King Walagamba had been used it as a security place. The steps in that foot path were built by using large stone blocks. The villages believe it is a work done by giant people who lived in Anuradhapura era. To reach the waterfall you have to travel in Badulla – Bibile main road. Passara and Lunugala are the closest towns. After passing Passara you need to travel about 10 km towards Bibile where you can see a name board of the Peessa waterfall at the right side. There is the road starting at that place. You have to travel about 6 km in that road to reach the foot path to the jungle. In that foot path, you have two walk another 500 m to reach the waterfall. It is difficult to walk the last 500 m in the jungle for an older person or a kid.